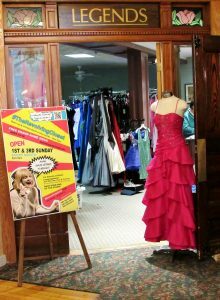 The Revolving Closet collects new and gently used formal and semi formal dresses throughout the year. Dresses suitable for events such as Home Coming and Winter Carnival are always available. Wait until you see our Dresses for the Prom, all the current styles in every size and all FREE. Available also there are shoes, bags, jewelry and other accessories to complete your outfit. Every girl should be able to feel beautiful, because they all are. This year our dresses are available through the months of March and April, at the Revolving Closet on the Sundays we are open. If that doesn’t work, call and we will make a time to meet you there during the week.